With offices in New York City, Edison, NJ, and Pennsylvania, Naik Consulting Group has recently hired three new vice presidents. John Tan, P.E. as vice president/director of structural design services in the Edison office. Tan brings more than 25 years of experience to the firm. His primary responsibilities include leading the firm’s structures group and supporting the overall growth opportunities through strategic planning, supervision, QA/QC, and client liaison activities. As senior vice president, Ken Standig, P.E. is tasked with overseeing the New York City office operations. His responsibilities involve overall QA/QC, client liaisons, personnel administration, and long- and short-range business and marketing and strategic planning. He has 40 years of diverse civil engineering experience with expertise in the planning, design and rehabilitation of roadways, transit, bridges, and infrastructures projects. Samir “Sam” Mody is senior vice president overseeing the New Jersey and Pennsylvania office operations and leading the firm’s short- and long-range plans and developing overall growth objectives and opportunities through strategic planning, supervision, QA/QC, and client liaison activities. Sam brings over 30 years of experience to the firm. Founded in 1997 as a multidiscipline engineering, land surveying and construction management firm, Naik Consulting Group offers structural engineering, civil engineering, land surveying, site engineering, municipal engineering, land use planning, bridge engineering and construction management services, electrical engineering, traffic and transportation engineering, and construction inspection services. For more information, visit www.naikgroup.com. Researchers from North Carolina State University and the University of Eastern Finland have developed new sensing skin technology designed to serve as an early warning system for concrete structures, allowing authorities to respond quickly to damage in everything from nuclear facilities to bridges. “The sensing skin could be used for a wide range of structures, but the impetus for the work was to help ensure the integrity of critical infrastructure such as nuclear waste storage facilities,” says Dr. Mohammad Pour-Ghaz, an assistant professor of civil, construction, and environmental engineering at NC State and co-author of a paper describing the work. “The idea is to identify problems quickly so they can be addressed before they become big problems and in the case of critical infrastructure, so public safety measures can be implemented,” Pour-Ghaz says. The skin is an electrically conductive coat of paint that can be applied to new or existing structures. The paint can incorporate any number of conductive materials, such as copper, making it relatively inexpensive. Electrodes are applied around the perimeter of a structure. The sensing skin is then painted onto the structure, over the electrodes. A computer program then runs a small current between two of the electrodes at a time, cycling through a number of possible electrode combinations. Every time the current runs between two electrodes, a computer monitors and records the electrical potential at all of the electrodes on the structure. This data is then used to calculate the sensing skin’s spatially distributed electrical conductivity. If the skin’s conductivity decreases, that means the structure has cracked or been otherwise damaged. Stat-X condensed aerosol fire suppression generators, manufactured by Fireaway, recently received an evaluation report (ESR# 3230) from ICC Evaluation Service (ICC-ES), providing evidence that the U.L.-listed electrically operated Stat-X condensed aerosol fire suppression fixed system generators meets code requirements. Building officials, architects, contractors, specifiers, designers, and others use ICC-ES Evaluation Reports to provide a basis for using or approving Stat-X condensed aerosol generators in construction projects under the International Fire Code. ICC-ES thoroughly examined Fireaway’s product information, test reports, calculations, quality control methods and other factors to ensure the product is code-compliant. “We are pleased that our ICC-ES evaluation report for our U.L.-listed electrically operated Stat-X fire suppression fixed system generators has been published. We feel it will help our U.S.-based distributors gain system installation approval from authorities having jurisdiction in states that have adopted IFC based fire codes that do not include NFPA 2010 as a standard and in turn condensed aerosol fire suppression systems as approved systems in their fire codes.” Chris Gendron, technical and quality specialist, Fireaway. A nonprofit, limited liability company, ICC-ES is the United States’ leading evaluation service for innovative building materials, components and systems. ICC-ES Evaluation Reports (ESRs) and PMG Listings provide evidence that products and systems meet requirements of codes and technical standards. ICC-ES also issues environmental reports verifying that products meet specific sustainability targets defined by today’s codes, standards, green rating systems, and ICC-ES environmental criteria. ICC-ES is a subsidiary of the International Code Council (ICC). For more information, visit www.icc-es.org. Stat-X fixed systems and Stat-X First Responders are automatic condensed aerosol fire suppression solutions. These fire suppression units are U.L. listed, eco-friendly (zero ozone depletion, zero atmospheric life, and insignificant global warming potential), and non-toxic and save lives and protect property for facilities, machinery, vehicles, and industrial sites around the globe. These units are deployed in the toughest conditions worldwide, including surface and underground mines, military vehicles, long-haul buses, rolling stock, remote telecom sites, wind turbines, power substations, electrical cabinets, and various marine and off-shore settings. Capable of being manually, thermally, or electrically activated by industry-standard control panels, Stat-X provides fire suppression solutions to customers around the world. Stat-X is manufactured by Fireaway, Inc., an ISO 9001-2008 certified company with production facilities in Minnetonka, Minnesota and Minden, Louisiana. All products are manufactured in the United States. Visit www.statx.com for further information. 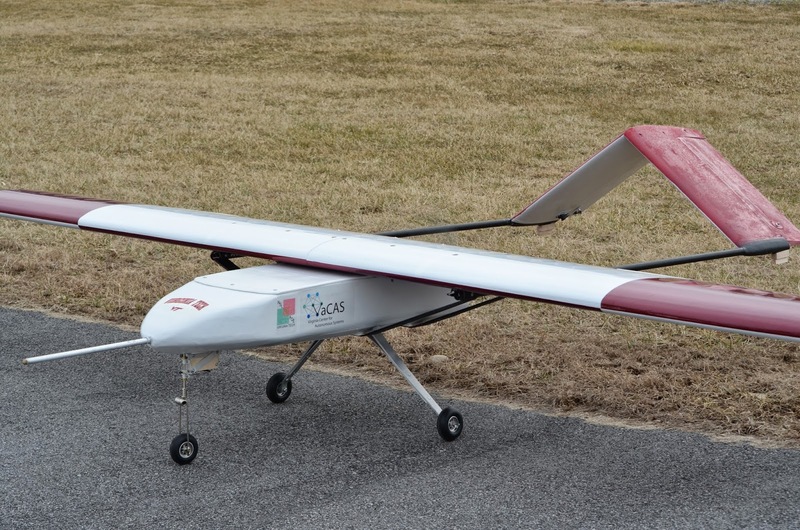 Led by a staff engineer, Virginia Tech students have redesigned an existing unmanned aircraft system by changing its power source and making it more reliable. Called the electric Small Platform for Autonomous Aerial Research Operations (eSPAARO), the new plane is powered by electricity instead of gasoline.The design is a revision of the Small Platform for Autonomous Aerial Research Operations, a fixed-wing airplane developed by Virginia Tech students in 2009. The new design was completed by John Coggin, chief engineer with the Virginia Tech Unmanned Aircraft Systems Test Site; Chris Kevorkian of Roanoke, VA, a master’s student in aerospace engineering; and Jeff Brown of Manassas, VA and Sean Lynch of Hackettstown, NJ, both seniors in aerospace engineering. The plane is a research platform for the aerospace engineering department and for the Mid-Atlantic Aviation Partnership, a consortium of about 35 government, academic, and industry groups led by Virginia Tech to help further introduce unmanned aircraft into the national airspace. In addition to making the plane more reliable, the wing loading was reduced by 59 percent, stall speed was reduced by 30 percent, and airframe weight decreased by 10 pounds. The engineers say the new design adds safety and reliability, is easy to setup and repair, and offers a replaceable wing and more payload options and easier payload access. “The aircraft is a tremendous asset for the Unmanned Aircraft Systems Test Site operation in particular and for Virginia Tech’s Unmanned Aircraft Systems research program in general,” says Jon Greene, the associate director for Strategic Planning and Development at the Institute for Critical Technology and Applied Science. The plane has been tested for endurance and operational features at the Kentland Experimental Aerial Systems Lab. The work is part of a proposal called “Unmanned Aerial System Airworthiness: A Case Study in Safety Certification for Complex, Non-Deterministic Systems,” by Craig Woolsey, director of the Virginia Center for Autonomous Systems and an associate professor of aerospace and ocean engineering. Other investigators include Christopher Roy, a professor in aerospace and ocean engineering, and Patrick Roberts, an associate professor with the Center for Public Administration and Policy; along with assistant professor Mazen Farhood, associate professor Leigh McCue-Weil, and associate professor Mayuresh Patil, all with the Department of Aerospace and Ocean Engineering. The proposal was funded by the Institute for Critical Technology and Applied Science and is a step toward developing a multidisciplinary research center that will promote the development of a commercial autonomy industry. Mark Palframan and Lawrence Hale, two aerospace engineering Ph.D. students in the Nonlinear Systems Lab, are working on methods to quickly and easily quantify and analyze uncertain unmanned aerial system controllers using the platform. Otherwise known as autopilots, these small unmanned aircraft controllers can be prohibitively costly to validate for unmanned aerial systems with low price points. One way to lower development time and costs is to better simulate and quantify uncertainty in these small aircraft.The overall goal of the program is to develop uncertainty quantification methods, and create policy development guidance for risk assessment, risk mitigation, and safety certification of autonomous vehicles. GEI Consultants, a geotechnical, environmental, water resources, and ecological sciences engineering firm, announced that it is providing certain Owner's Engineer services for the proposed Sacramento Municipal Utility District (SMUD) Iowa Hill Pumped-Storage Development project. GEI is a member of the Jacobs Associates team for the project, and SMUD recently awarded the team the Owner's Engineer services contract for preliminary design and construction services on their proposed Iowa Hill Pumped-Storage Project. If constructed, Iowa Hill would be a 400-megawatt pumped storage hydroelectric facility. GEI will lead the design of the 6,400 acre-foot upper reservoir, a lined impoundment that will be formed by an earth- and rock-fill dam with a maximum height of more than 200 feet and a crest length of 5,900 feet. The design of the dam and reservoir will come under the regulatory authority of the Federal Energy Regulatory Commission (FERC) and the California Division of Safety of Dams (DSOD). The project would utilize an existing reservoir on the American River, from which water would be pumped up to a new 6,400 acre-foot capacity upper reservoir, where the water would be stored. During peak electrical demand periods, water would flow from the upper reservoir to the lower reservoir via a 1,000-foot-deep (305 m) shaft through 3,500 feet (1,067 m) of water tunnels. The electricity generated would connect the existing transmission line that connects SMUD's existing Upper American River hydroelectric project with the district's customers. The team consists of Jacobs Associates (prime), GEI Consultants, HDR Engineering, AF-Consult of Switzerland, Carlton Engineering, AMEC, IEC Corporation, Northwest Hydraulic Consultants, Stillwater Sciences, Ascent Environmental, Crux Subsurface, and Foxfire Constructors. GEI's multi-disciplined team of engineers and scientists deliver geotechnical, environmental, water resources and ecological solutions to diverse clientele nationwide. For more information, visit www.geiconsultants.com.